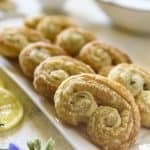 Get a sweet dose of citrus with a few of these super easy, 4-ingredient Lemon Thyme Palmiers! Sheets of buttery store-bought puff pastry are transformed into crispy springtime treats with some help from a bit of sugar, lemon zest, and fresh thyme. Remove the sheets from the box and outer wrapping, the thaw the sheet of puff pastry at room temperature for 30-40 minutes until they unfold easily. While the pastry is thawing, make lemon sugar. Place 1/2 cup of granulated sugar in a bowl, then add the zest of a lemon. Rub the zest into the sugar with your fingers, infusing the flavor. Sprinkle 1/3 of the lemon sugar on a large work surface. Place the two sheets of pastry on top of the sugar and press the edges together to create one long sheet, using a bit of water to help adhere them. Use a rolling pin to thin out the pastry a bit, enlarging it by 1/2"-3/4". Sprinkle another 1/3 of the lemon sugar on top of the pastry, pressing it in with the palms of your hands. Evenly sprinkle on the thyme leaves. Gently roll each long end to the center of the pastry, making sure each side is rolled tightly and evenly. Carefully cover with plastic wrap and chill for 40 minutes. Preheat oven to 400 degrees F. Slice the rolled dough into 1/2-inch slices. Press each slice into the remaining lemon sugar, then place 2 inches apart on 2 parchment-lined baking sheets. Bake for 10-15 minutes, flipping each palmier with a spatula at the halfway mark. Remove when they're golden brown and crispy. Transfer the cookies to a baking rack and cool completely before serving. For a quicker Puff Pastry thaw, wrap the sheets in paper towels and microwave them on high for 15 seconds. Turn them over and microwave for another 15 seconds, adding an additional 5 seconds on each side until they unfold easily.